We are successfully meeting the varied needs of our patrons by offering a wide gamut of Karl Fischer Titrator as per their precise needs. Providing a range of titration instruments and accessories for analysis and dosing applications in water, food and beverage, pharmaceutical and other applications. Learn more about titration. We have 2 models for Karl fischer titrator as per cost and user's requirement. 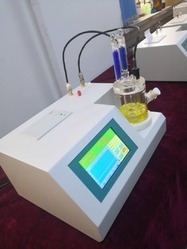 This used for accurate determination of moisture in various samples. The instrument is housed in a abs cabinet with built in magnetic stirrer & attached titration stand. Controls are on the front panel for easy operation. 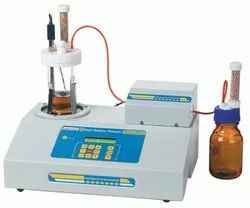 Karl fischer titrator is used in chemicals, pharmaceuticals, food, cosmetics, oil & many other industries in q. C. & r & d laboratories. - Sharp and stable end point. This method is ideal for limit detection of extremely adhesive and viscous media with a minimum conductivity of 1 µS/cm, e.g., in the preparation of cream cheese, or the manufacture of ketchup and mayonnaise.